The members of the super group Chickenfoot truly found each other. Drummer Chad Smith (Red Hot Chili Peppers) and former Van Halen members bass player Michael Anthony and singer Sammy Hagar were jamming together on a regular basis a few years ago. One thing lead to another and to record their first album they also got one of the best guitar players in the world to join, Joe Satriani. According to themselves, it's really a band the guys want to have fun with. This was already clear on the first record, but especially at the live shows. And now there's even a follow up named III as a joke. And this time they had a lot of fun again, so much is clear. Like their début it turned into a typical classic rock album, which is not a surprise considering the musical background of the musicians. This doesn't result in memorable songs, in fact all rock clichés are used. But they are convincing and played with lots of enthusiasm. Once again it's refreshing to hear Satriani play normal rock riffs, without the endless fiddling. Which can be nice once and a while for the ones who are into that, but his playing is much more balanced this way. Now and then he's allowed to go wild, and he's doing that in a great way, like in the first single 'Big Foot'. Of course the songs are full of Hagar's cries like "yeah!" and "ohw!". The song 'Up Next' is even overloaded with them. This is a bit too much sometimes and can turn into a nuisance. But 'Dubai Blues', a great rocker that is right on the spot, compensates completely for it. Everything is kept together skilfully by Smith and Anthony. There's also an attempt to dig deeper: in 'Something Going Wrong' about the environment, and in 'Three And A Half Letters' about an Iraq veteran looking for a job. It feels a bit awkward, because the lyrics are too simple for that. The band probably didn't want to make it too difficult and heavy. 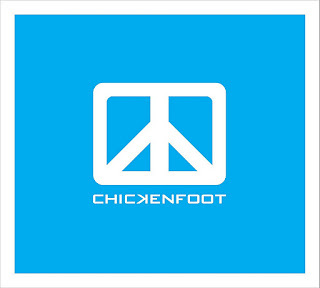 Don't expect any new findings from Chickenfoot's second coming. These are a band and album that have fun written all over it. Straightforward rock songs, played by great musicians. And that can be damn fine now and then. Listen to 'III' on Spotify.